Pageclip works great when you want the simplicity of a static website, but don't want to setup a server for a form or two. Capture leads on landing pages, use for contact forms, collecting emails for a newsletter, polls, surveys, etc. Pageclip works anywhere you can put an HTML form. It works with any static site generator e.g. Jekyll, Hugo, Hexo, GitBook, Gatsby and all others. Pageclip also works on any hosting provider, from blog hosting providers like Wordpress, to static hosting providers like GitHub Pages or S3, to Platform-as-a-Service providers like Heroku and Docker, and any other method of hosting you have up your sleeve. Create a Pageclip account if you haven't already. Once you have created an account, Pageclip will ask you to setup a site. A site is a website that has one or more forms you want to save to Pageclip. Give your site a name, and its domains. Domains - Domains are a comma-separated list of domains (with or without subdomains) that can send data to this Pageclip site. For example, example.com,localhost will save data from forms on http://example.com, http://www.example.com, and http://localhost:3000, but reject data from http://www.unicorns.com. If you have more than one form on your website that you want to store in Pageclip, you will need to create a named form in Pageclip's UI for each form on your site. For example, if you have a contact form and a newsletter form, you would create two named forms in Pageclip: contact, and newsletter. Pageclip provides an HTTPS endpoint that will accept form data for each site and form. After you have created a site in Pageclip, it will show you the code to place on your website. Step 1: You place a script tag before the </body> tag. This script provides the Pageclip global. By default this script will look for all form.pageclip-form elements on the page, and wrap them. Step 2: Next, you add the stylesheet to the <head>. It provides a loading spinner on the submit button and a 'thank you' message shown to the user after they have submitted the form. Feel free to override it with your own styling. Step 3: Create your form with the specified form element. The key pieces are the action= attribute and the class="pageclip-form" attribute. Add your own <input /> tags with your own form fields, taking care that they have a name="..." attribute. Only fields with a name attribute will be saved to Pageclip. Note that the form is submitted asynchronously and shows a 'thank you' message to the user once successfully submitted. Checkboxes (<input type="checkbox">) are stored as booleans. When unchecked, the browser does not send the input in the request, so a checkbox value will either be true, or the key will not exist at all. File inputs (<input type="file">) are ignored, and multipart requests will be rejected. email - the user's email. This will be used in the reply-to field of the email that Pageclip sends you. So all you have to do is hit 'Reply' in your email client to respond to the user. subject - This will set the subject of the email that Pageclip sends you for each submission. With this form, Pageclip will save the data, then redirect back to the originating page. Pageclip can overlay a loading spinner on your submit button with some special markup. You must have a <button> element with the .pageclip-form__submit and a <span> child. By default the spinner is white. You can change it to black by adding the pageclip-form__submit--dark-loader class to the button. When a form is submitted, the <button> will go through a few CSS class states. These classes provide CSS animations. .pageclip-form__submit--end-loading: hides the loader, and fades the <span> text back in. If the inner <span> is not specified, it will just overlay the spinner on the text. If an <input type="submit" /> is used, the loading spinner will not work. A button must be used as the loading spinner is rendered in the ::after pseudo element. The start and animations can be removed from the button. If animations do not exist, the JS will detect it and only add the .pageclip-form__submit--loading class to the button. Pageclip works with any form validation library or scheme. If you have a favorite, just use that! If you are unsure, we recommend using HTML5 validation that is built into the browser. HTML5 validation is very rich these days, and has good browser support. For more info, check out our blog post on HTML5 form validation. HTML5 validation has a few warts, so we created an open source library called valid-form that makes them nicer. When https://s.pageclip.co/v1/pageclip.js is included on the page, a window.Pageclip object is created. With it, you can hook into form submission, or send data to pageclip without a form at all. Pageclip.form(...) wraps a form, submits the data to Pageclip asynchronously, and gives you a couple hooks into the lifecycle. You can use these for things like validation or displaying messages to the user. By default, any forms with class pageclip-form will be automatically wrapped with Pageclip.form(...). form:HTMLFormElement - the <form /> element to submit to Pageclip. It must have an action pointing to your Pageclip site. Pageclip.send(...) allows you to send arbitrary JSON data via XHR to a Pageclip form. siteKey:String - Your public siteKey; a unique token give to each site. formName:String - The name of the form to save to. If you wish to send to a default form, formName must be 'default'. data:Object - The actual data to save. JSON.stringify() will be called on this object before submission. error:Error - null when the request succeeds; Object with .message on failure. You can set up Pageclip to call a URL on your own server for each form submission. Pageclip will make an HTTP POST request to the URL of your choice with JSON data about the new item. 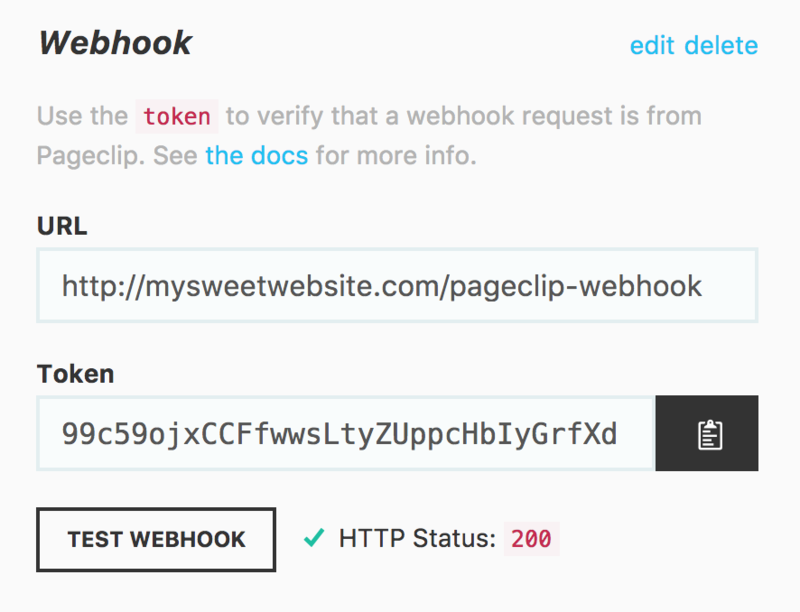 To be clear, a webhook will be called each time a user submits a form. In each POST request Pageclip makes to your server, it will include a token in the request body. On your server, you can use this token to verify that the request is from Pageclip. You can copy this token in the Pageclip UI once you have set your URL. We advise you keep this token in an environment variable on your server. item.payload is the actual data the user submitted. The REST API allows you to send and fetch data from a Pageclip site/form. You can use the API from a script, server, or anywhere other than a browser that can make HTTP requests. The API uses a private API key that is different from the siteKey. siteKeys are write only, while your API keys are read and write. It is important not to share your API keys or place them on your website. You can tell API keys and siteKeys apart by the prefix; API keys are prefixed with api_. # An example. API keys are prefixed with `api_`. Keep this key private! At this time, each site you create in Pageclip gets its own private API key. i.e. There is no single API key for your account that works across all of your sites. If you do not set this value in the header, future API version changes could break your client. At this time, there is a node API client. See the node API client GitHub page for documentation. Pageclip uses HTTP Basic Auth. Your API key is sent as the username, and there is no password. The API key must be base64 encoded. Save JSON data to a form. Allows submitting one or many items. Returns a JSON object with the form name, and an Array of the Items that were saved. formName is optional; when formName is omitted, it will save to the default form. Fetch items from a form. Returns a JSON object with the form name, data type of data, and an Array of Items. At this time, GET returns all items in a form. formName (optional); when formName is omitted, it will retrieve items from the default form. archived - true or false. When false, it will return only unarchived items; when true, it will return archived items. By default it will return all items.